Clematis 'Tudor' a deciduous, perennial climber with dark green foliage and medium-sized, violet flowers that appear late spring, early summer and late summer. 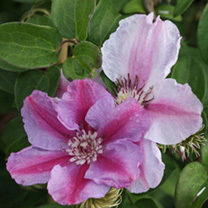 Clematis 'Tudor' belongs to pruning group 2. Flowers May-June & August. Height 100-150cm. Supplied in a 3-4 litre pot.